Vocational Homemaker: Handmade Handkerchiefs. That's how I roll. Two months ago Ella and I attended the funeral of one of my dearest friends, Elizabeth DeHority. As we were packing to go, I asked Ella to pack a few extra handkerchiefs for me, but she had already thought of that and had packed every one we had. It wasn’t enough. And we couldn’t even find boxes of paper handkerchiefs at the funeral home or church either. 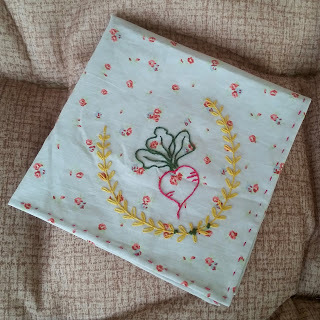 I tried handing out my handkerchiefs to our friends there, because frankly some of us were a huge ugly blubbering mess, but they were reluctant to take mine, I guess because very few people will just hand you one of their own handmade handkerchiefs. 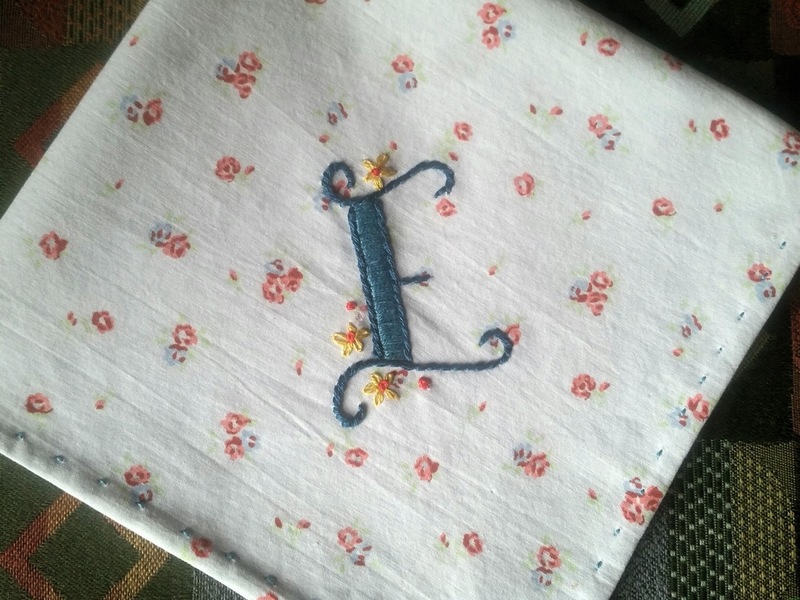 Since then I’ve been teaching myself to do embroidery so that I can make some pretty handkerchiefs to give out for just such occasions. Until recently my work was, how shall we say? - “primitive”. My very first hankie. See? Primitive. I’m still very much a beginner, but I did at least hit upon a method of rolling the hems neatly and making the stitches and even size and even spacing. 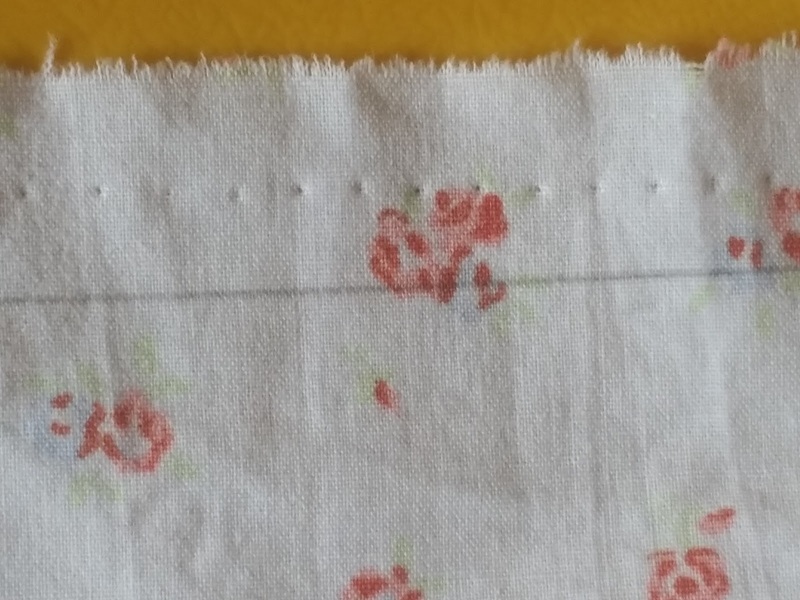 First, I draw a line on the wrong side of the fabric, exactly where I want the hem fold to meet. I use an ordinary #2 pencil because I have them, and the line won’t show when I’m done. Then I set my sewing machine for the longest stitch length and run the edges thru the machine without any thread, to make tiny holes in the seam allowances. I use these holes to help me space my stitches evenly. This is the wrong side of the cloth. Aren't you impressed with how neat that E is? The fabric is a Ralph Lauren sheet that I found at the thrift store. So soft. I tear the fabric rather than cut it so the edges will be on grain. 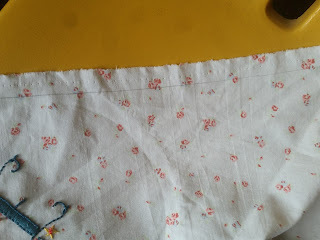 It also creates a very soft edge which doesn't make a hard line in the hem. 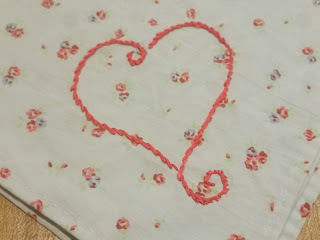 To hem, I gently roll the edge of the fabric till it meets the line I drew, then I take a stitch in the line, a stitch in the roll, a stitch in the line, a stitch in the roll, over and over, until the whole hem is done. This post at purl bee shows exactly how to do this. At the corners I fold a miter as in this post on my old blog. The finest hem I've ever rolled. So far. This one is for me. Because I still haven't stopped crying. I've been wanting to brush up on my embroidery skills! What a brilliant idea. Thanks for the inspiration! You've done a beautiful job.